Bob Fleming hires out-of-work reporter Dexter Vega to look into the death of his son, Liam. Liam drowned while kayaking the calm waters of the Intracoastal Waterway. The circumstances of his death are suspicious, as he’s a young, athletic man, an excellent swimmer, and an experienced kayaker. Set in Florida, the investigation leads Vega from Sarasota to the picturesque barrier island of Siesta Key and back. Beach bums and drum circle participants abound. Vega spends a lot of time chatting with people in bars and on the beach, infusing the novel with a laidback, vacation vibe. Money rears its head, however, complicating the investigation. Valuable beachfront property, drugs, and a sofa-surfing second victim keep Vega searching for the truth. The story unfolds at a leisurely pace. Vega follows the clues that lead him back and forth across the area, occasionally crossing paths with the local police and stirring up trouble, putting himself in danger of becoming the next victim. In Vega, Lopez has created a protagonist with serious flaws. He’s a terrible father, drinks too much, and clearly has trouble interacting with women. But he is persistent, ultimately solving the case before the police do. 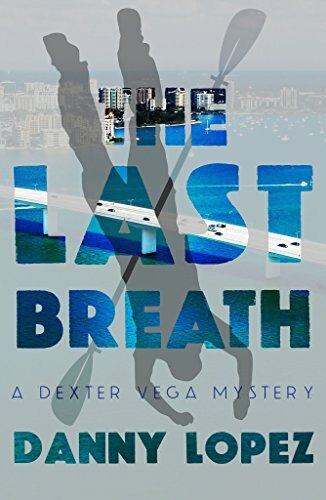 While The Last Breath is the second in a series, it can be read as a standalone. Lopez includes enough information to link to the earlier novel, without making new readers feel left out. One of the themes woven throughout the novel is the idea of growth and change potentially destroying a delicate ecosystem. As with many geographically isolated regions, the influx of outsiders and profit-driven actions threaten to eradicate the very things that drew people there in the first place. The question of who wants to help and who wants to hurt coincides with the larger question about the sanctity of space. While the murders in The Last Breath may be fictional, the future of Siesta Key is all too real. Long hailed as one of the best beaches in the United States, the real-life battle over new construction makes the perfect backdrop to Lopez’s fiction. Fans of a low-key, amateur sleuth mystery may want to give The Last Breath a try.